One of my favorite television sceens ever. I don’t know if it’s Authentically Black, but if it’s not, what is? Today’s blog is taken from Scot McKnight’s “Jesus Creed” blog. Scot is a theologian and excellent blogger. The post is about plagiarism in sermons. Now most of us have heard a plagiarized sermon before, we just don’t know it. McKnight sheds some much needed light on what is wrong with plagiarism in sermonic material and I think all us pastors, preachers, teachers and church leaders should take note. I once was in a situation when a pastor admitted to using sermons from sermon sources, and he also said he hadn’t thought there was anything wrong with it. What most confused me about the situation was that he was using illustrations from other preachers in the first person  and you really did think these experiences were his. So far as I know, he stopped. First, it is not honest. Part of the pastoral task is to preach (if that is part of your job description), and that means preparing their own sermons. I dont know any search committees that prefer their pastoral candidates and preachers to use sermon sources [in order to borrow or swipe sermons preached by others on a routine basis or without acknowledgement  added in light of Steve Mays fine suggestions and clarifications below]. Second, the temptation is evidently strong, and Id like to know what you think drives plagiarize sermons, but heres what I see. Sometimes they dont have the time to get a sermon ready. Sometimes they have too many sermons or talks to get ready for the week and resort to using somebody elses for one of the talks. Sometimes the pressure to be a good preacher is so strong the preacher is tempted to use someone elses already-shown-to-be-good sermon. Sometimes there are so many good preachers in the area swiping sermons is the only way a preacher can compete. Sometimes a pastors job is on the line for how he or she preaches and they are able to postpone the inevitable with a few good sermons swiped from a source. Third, pastors should not subscribe to such services if they are at all tempted to swipe sermons. I suppose these services are designed to help pastors see what good preaching looks like  but thats another series. If the temptation is there, it is far wiser to make it unavailable. Fourth, sermon services are partly culpable here: Ive never been part of this so Id like to hear how they work. Do they warn of plagiarism? Do they educate on the proper use? Someone will know more than I about these services. Fifth, what is a sermon? Well, its a whole life brought to bear on a text each week for a single 30 minute or so sermon before a specific congregation. It shames the preacher not to be who he or she is in the pulpit, and to pretend to be someone else. It de-localizes the sermon from the local context. It distorts who the preacher is before the congregation. So, the sermon is highly biblical, highly personal, highly local, and highly temporal: it is the individual preacher engaging God and Bible and congregation, in that specific location, for that time. Sixth, which brings up the philosophical issue: Is there not nothing new under the sun? Well said. To be sure, nearly every sermon emerges from books and sermons and ideas and all sorts of things that were used. But it is bricolage, it is quilting, it is convergence  it is precisely those things and not simple usage of others. It brings together other peoples ideas and says so if it is substantial; but it is a uniquely personal, local, and temporal bringing of those things together. Taking someones sermon destroys the bricolage and turns it into a canned, deceitful act of creating a false image in front of Gods people. I’m taking a break from the “Authentically Black” series to give everyone a heads up about a new book. 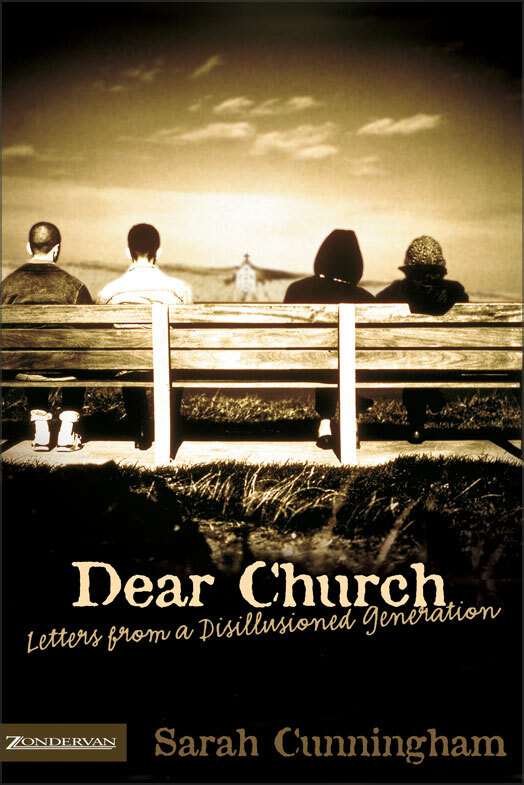 Sarah Raymond Cunningham has written a wonderful book, entitled, Dear Church:Letters from a Disillusioned Generation. 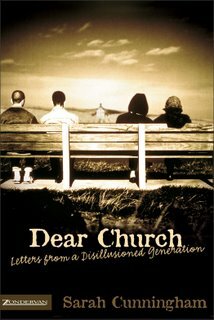 Dear Church is a series of letters from Sarah to the church concerning the issues she views as those most deeply affecting young adults and the young at heart. She is a thoughtful, elegant writer, and you would be more than blessed by reading her book. Dear Church just hit store selves this past Tuesday, so your local might not have it, but of course it is available on Amazon.com. I was privilege to read and offer insight to Sarah’s first chapter. She found me via this blog and asked for my feedback. In truth, I offered very little because what she wrote was so thorough. In a gesture of thanks, Sarah has listed me–along with other writers and bloggers–in the acknowledgements section of her book. You can add your own thoughts and letters at www.dearchurch.com and become part of a community that looks to do more than complain and gripe about the problems facing the church and seek lasting dialogue and solutions. What now passes for “authentically black” really isn’t! For example, as a boy I had a high bar set for me educationally. My father grew up in the inner-city of Jackson, Mississippi. (Now, if there is a racist place on earth it is definitely in Mississippi.) Yet my father and each of his three brothers maximized the opportunities given them, and that was in a day and time when there weren’t near as many opportunities available. The cousin’s, the children of my dad’s three brothers, my brother and myself have come to own businesses, have been successful in the military and law enforcement world, made millions in the tech boom of the late eighties and early nineties, and–some would say–have done a pretty good job in ministry. In many ways, my cousins, my brother and I are the picture of the American dream. Our grandfather, didn’t finish the 3rd grade. He worked the land, and my grandmother cleaned rich, white people’s houses, and watched neighborhood kids for money. My dad, and his brothers, Forrest, James, and John, made the most of their opportunities and viewed leaving “the ‘hood” as the objective to life. The same was true of my parent’s friends whom I knew as I child. They became doctors and lawyers, university professors and entrepreneurs. This did not make them less black, but it did make them optimistic. What is so desperately lacking in much of the black community is simply optimism; the belief that hard-work and catching a break here and there would lead to a better life. (And by the way, both those things are important. I reject the right-wing position that success is all about hard-work, but I equally reject the leftist position that everything comes down to breaks. For an economic underclass to rise, people need both.) Truly, nihilism is so deeply embedded in some parts of the black community that anyone who makes it out is considered some kind of race-traitor or is trying to be something or someone that they are not. The logic flows like this: Our case is hopeless, everyone hates us, we’re doomed to this fate, therefore those who make it out must have acquiesced to “whitey”, so they are no longer “black enough”. Now, let me say, if you’re black in America, things can often seem hopeless, and there are plenty of people who hate you and even more people who practice a working racism and don’t even know it. I’m not saying that racism doesn’t exist or that there aren’t obstacles to overcome. What I am saying is that the racism faced today may be more subversive, but is certainly no more severe than what my father, his brothers and his friends endured in the days of institutional racism and Jim Crow and they reached farther and achieved far more than their father could have. I’m interested in recapturing the essence of what it means to be authentically black. What it has meant to be black in America since we were brought here, and not just what it has come to mean in the last 20 years. I’m optimistic that we can. What about you? I was in Portland, OR a few weeks ago and took the opportunity to swing by Powell’s Books. Powell’s is the world’s largest independent new and used book store. It encompasses an entire city block and is about four stories high. I spent two hours there and could have spent much, much more. At Powell’s I purchased two books on one subject that has become increasingly important to me as I grow older. The subject is ‘race’. This past May I spoke on the topic of race and the church at the Pepperdine Bible Lectures and was truly disappointed in the attendance and interest. Jerry Rushford and the folks at Pepperdine do an incredible job putting together the lectures and I am grateful–not to mention humbled and shocked–that they keep letting me have a blank sheet in regards to what I teach. At any rate, the two books were Joseph C. Phillips’, He Talk Like A White Boy, and John McWhorter’s, Winning the Race. You may remember Joseph Phillips from his turn as Denise’s husband in the latter years of The Cosby Show, and McWhorter–well, McWhorter is just smarter than most people you’ll ever meet. Phillips is a self-avowed conservative, while McWhorter seems to lean to the right, but is somewhere in the middle politically. Either way, both men have some very compelling and important things to say about the state of race relations in America–and for the most part–I agree with them. Both writers, give sharp, intelligent critiques of the thinking and policies that have contributed to the contemporary condition of the black underclass, the seeming disdain for education in the black community, what has caused and is causing the economic disfunction in the black community, and most importantly, what it means to be “authentically black”. Of course, having achieved what they have achieved, being proficient in the proper use of the English language and not wearing their pants around their ankles, both men have and continue to hear taunts of not being “black enough”. Or worse, “not black at all”. They are not the only ones. People like Condelezza Rice and Colin Powell–because they have taken the most advantage of the opportunities granted them and have not bowed to hip-hop culture–have also had to endure the thoughtless, inane disdain of others who feel that any black who succeeds in endeavors other than art, music, sports, or dance have somehow abandoned who they are. And honestly, I have often heard many of the same things. My parents grew up in the 50’s and 60’s and were part of the Civil Right Movement, a movement designed to be practiced in peace and love for enemies with equal access to education, pay, and work as the end goals. When my father talked about those days I listened and took his words to heart. Doing well in school was important, being competent in my field of endeavor was important, and knowing that I was as capable and worthy as my white counterparts was deeply ingrained in my mind. Therefore, I have always seen my life–one with a good education, a beautiful family, a house in an integrated community, a fulfilling job, the respect of my colleagues and countless opportunities–was the point of what Medgar Evers and Martin Luther King died for. Unfortunately, there are some who now see that kind of life as antithetical to “being authentically black”. For example, does anyone remember that pointed and correct Chris Rock–whom I love–routine where he says, “Black people get more respect for coming out of jail than getting a Master’s degree”? This type of treatment of one another is exactly what McWhorter, in another work, calls “self-sabotage” in black America. And in my opinion is one of the root causes that smart, capable blacks often fail to break out of generational poverty and educational failure. People like Phillips, McWhorter, Rice, Powell and countless others should not be treated with contempt for who they are what they’ve done, they should be treated as heroes in and of the black community.